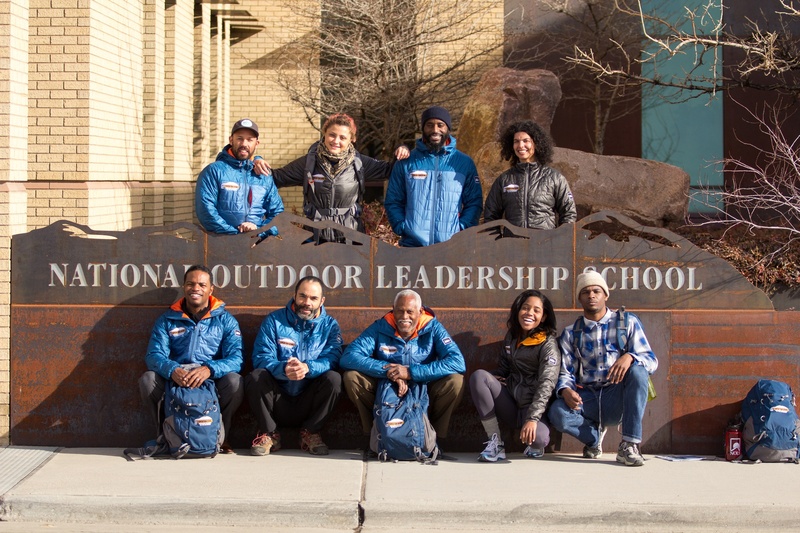 In the summer of 2013 NOLS brought together a group of inspiring role models who made history as the first team of African Americans to blaze a trail up America’s highest peak—Denali. To mark the 100th anniversary of the peak’s first ascent, Expedition Denali set out to change the face of the mountain. Though the summit was a goal, the ultimate objective was not just to make mountaineering history, but to build a legacy by paving a way for young people of color to get outside, get active, get healthy, become passionate about America’s wild places, and chase their own Denali-sized dreams. Our wild places and outdoor spaces belong to us all, but a majority of people enjoying them are not of color. These same communities will soon comprise the majority of our country’s population. Outdoor participation rates among African Americans, and especially kids in that demographic, remain the lowest in the nation. The well being of our communities and our outdoors is tethered to inspiring more people across demographics to get outside and get active. To kick-start this inspiration, grassroots events occurred across the nation during Expedition Denali’s historic summit bid, with tens of organizations rallying over 2,000 people, young and old, to take their own “10,000 Steps to Denali” (the round-trip distance between High Camp and the summit) in outdoor spaces in their local areas. Organizations such as GirlTrek, Outdoor Afro, Boys and Girls Clubs of America, and various YMCA’s rose to the challenge, ultimately activating over 2,000 young people to take 10,000 Steps to Denali in solidarity with the team on the mountain. After the expedition the mountaineers have continued to engage young people during a yearlong national speaking tour to Outdoor Nation Summits, historically black colleges, ethnically diverse universities, churches, schools, nonprofits, and outdoor outreach organizations in Atlanta, Austin, Boston, Chicago, Denver, the D.C. metro area, Los Angeles, Minneapolis, New York City, Portland, San Francisco, and Seattle. To date, the mountaineers have spoken to over 3,000 people during this tour. By 2015, Expedition Denali will have directly engaged 10,000 people across the nation. Voted “Heroes of the Year” by Backpacker magazine and awarded the Outdoor Inspiration Award by the Outdoor Industry Association, Expedition Denali has already had a profound impact on thousands of people. But the mission will not end with the completion of their speaking tour. This fall will see the release of a book about the project as well as a documentary film that will tell the story of this game-changing expedition and spread its inspiring message to a broader audience. Rising to 20,320 feet above sea level, Denali, also known as Mount McKinley, is the highest peak on the North American continent. Hudson Stuck’s expedition team made the first ascent of the main summit of Denali in 1913. The first woman to summit the peak was Barbara Washburn in 1947. A team of predominantly African Americans has yet to summit Denali. NOLS provides transformational outdoor experiences for individuals from all communities and walks of life. At the heart of our philosophy is the belief that positive, ethical leaders change the world. NOLS teaches and nurtures these leadership skills, which are transferable to any aspect of our students’ lives, in the wilderness setting. We empower our students to feel like they can take on any challenge in the world, and ultimately give back to their own communities and to the wilderness. We inspire youth to fall in love with wild places and work to protect them. And we create positive role models—heroes—whom youth everywhere can emulate. NOLS fosters these leaders by taking students ages 14 and up on extended wilderness expeditions into some of the most spectacular and remote locations, where they learn backcountry living skills, technical outdoor skills, leadership, environmental ethics, and how to enjoy nature responsibly. In 2011 more than 15,000 students enrolled at NOLS locations across the globe on expeditions ranging from 10 days to a full year in length. NOLS was the first commercial outfitter on Denali in 1971 and has regularly run expeditions on Denali since then. The success of NOLS’ Denali expeditions can be attributed to the fact that NOLS does not simply “guide” participants up the mountain. We run our Denali expedition like any other course, training participants to become technically versed in mountaineering skills while they acclimatize and running participants through the leadership progression so that by the end of the expedition, participants who merely followed the instructors become leaders. Today, NOLS runs up to two Denali expeditions every year. Only a small percentage of our nation’s population of color are participating in the outdoors. Outdoor participation rates among African Americans, and especially kids in that demographic, remain the lowest in the nation. The health and well being of our increasingly diverse population—and especially our African American population—depend on their remaining active and engaging in nature. The well being of our public lands is also tethered to people of color reconnecting to our wild places. By 2042, people of color will comprise the majority of the U.S. population. Americans of color are the future stewards of the extraordinary and wild lands we all cherish. As part of America’s up-and-coming majority, they will have a mounting influence on the protection of our wilderness. But without opportunities to experience our great outdoors or role models to inspire them to remain engaged in it, passionate voices from this increasingly diverse constituency won’t be heard. The goal of the expedition is to engage a broader constituency in a public dialogue about diversity in the outdoors, specifically in the field of outdoor recreation and education—to raise awareness of the value of diversity in the outdoors and build a coalition in the outdoor industry that is dedicated to addressing the cultural challenges head-on. As our nation’s demographics change and our next generation—comprised mostly of people of color—take the reins, their comprehension of the benefits of outdoor recreation to their quality of life and to the stewardship of our wilderness is vital, making Expedition Denali an unprecedented opportunity not only make history, but build a legacy.